The Mitsubishi EVO X Dominator 2.0 is an outstanding performer featuring a proprietary state-of-the-art 52 lb/min Garrett GT compressor wheel (with an unheard of 79% maximum efficiency) combined with a race proven proprietary 11 bladed Garrett turbine wheel all wrapped up in a true Mitsubishi bolt on package. The Dominator 2.0 utilizes the very latest in Extreme duty thrust bearing technology that increases surface area, durability and oil flow to the turbo thrust surfaces. 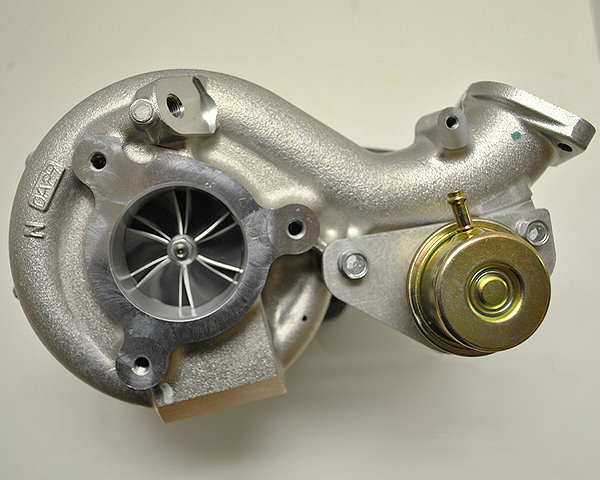 Our complete in-house machine shop performs all necessary machine shop operations to precise tolerances (no hacker work here) to maximize turbocharger efficiencies and provide our customers with the best possible product and customer service. Blouch Performance Turbo was founded by Robert Blouch Sr. in February 1980. His son, Bob Jr., joined the business in 1990 and spearheaded the development of bolt-on upgrade turbos for the emerging four cylinder sport compact market. Today, Blouch Performance Turbo offers a complete line-up of custom performance bolt-on upgrades for popular vehicles such as the Subaru WRX/STi , Mitsubishi EVO VIII, IX and X, Porsche 996 and 997, Mitsubishi 3000GT, and Dodge SRT4 and Caliber. The components used in these upgrades are state-of-the art such as fully machined billet compressors with advanced aero, custom turbine wheel and shaft assemblies, and custom compressor and turbine housing castings that are machined in-house on their own CNC equipment.